The Showtec LED Operator 1 is the most economical LED controller in our range. It is a simple but powerful controller for non-complex light applications. 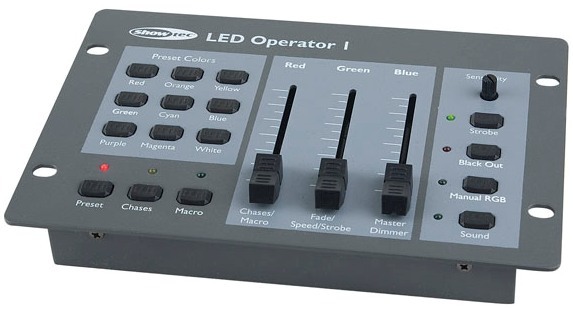 Consisting of 3 faders to control the Red, Green and Blue LED's of your PAR Can. It has 9 preset colours which can be selected by the push of a button. It has several chase patterns which can be controlled manually or by sound activation via the internal microphone. The LED Operator 1 can control an unlimited number of fixtures providing they all set to DMX channel 1.